Ever cuddled a slug? Yeah, neither have I. 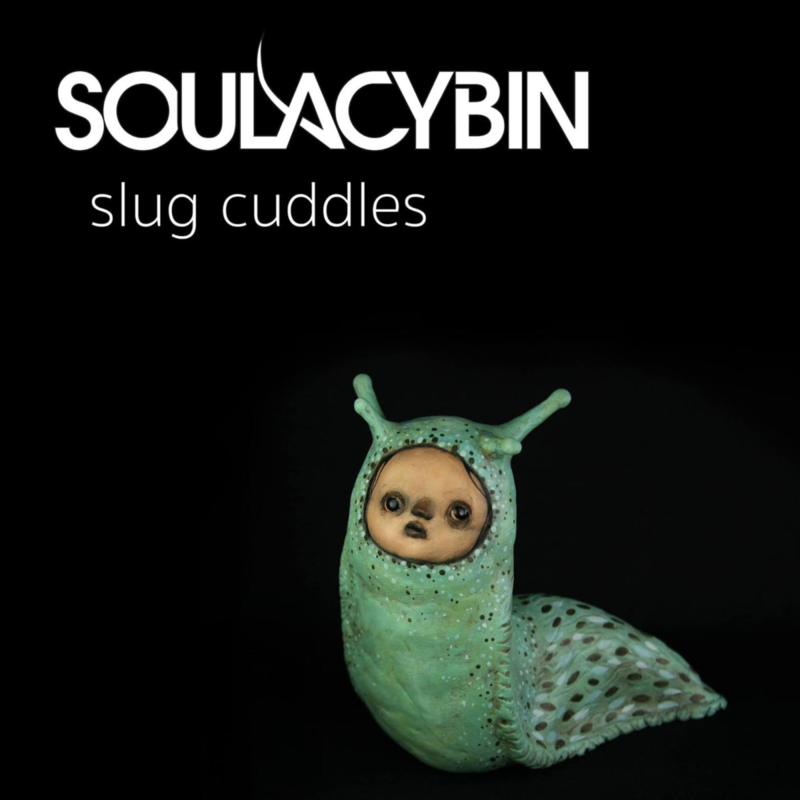 However, listening to the latest album from Soulacybin, Slug Cuddles, brings you pretty darn close. And while every song is not without sweet and squishy beats, Slug Cuddles isn’t just about the squish. This album encompasses many different moods to create a funky, psy-bass complex that is at once downtempo yet danceable. First, the Colorado based artist creates an ultra-funky background of rhythmic beats overflowing with bouncy waves of sound. Emerging out of this sequence of mind-bending twists and turns comes unique, mysterious melodies that stand out amongst the psychedelic sonic pulp. Take a drink, because Soulacybin has concocted the perfect entheogenic juice to transport your mind directly into the depths of space. One sip, and the listener begins to feel the effects…a drowsy, deep feeling takes over as layered bass begins its descent into spacey psy-trance grooves. This is “Shrums”, the opening track that dives deep into the wormholes of the mind, bouncing in and around the geometric designs that appear as you close your eyes. “Shrums” is instantly and effortlessly a psychedelic trip manifested into sound. This particular trip is taking you down a finely crafted rainbow roller coaster through a kaleidoscope. There’s dips, fast curves and even stairs. Guided by the psy-trance and a light dusting of dub, this kaleidoscopic journey soon descends from the depths of space and into the clouds, slightly closer to Earth. This is where the second track “Anfitrion” comes in, full of breathy timbre and plenty of funky guitar. This song sounds like a full-on dance party in the clouds, complete with 70’s onesies, champagne and bubbles. As the party begins to peter out, partygoers gather to watch the sunrise atop the fluffiest cloud. The guitar sound transitions to ambient and dreamy. On this track “Dangatang”, the guitar twinkles, and the deepest sounds resemble a heartbeat. But as the sun rises high in the sky, Soulacybin brings back the upbeat tempo, lovable squish beats and your body is once again dancing to the intoxicating grooves. With an infectious ability to transition from upbeat vibes to dreamy downtempo, the third track “Slug Cuddles” is the perfect title: some parts of the song sound like they belong in a hip club in Brooklyn, but Soulacybin tosses in a strange sample or slippery bassline at just the right time, proving that this music is definitely out of the ordinary. Following “Slug Cuddles”, Soulacybin continues to treat his listeners to delicious surprises: the next track “How To Cast A Spell On Somebody”, is abrasive and laden with trap beats. It is also incredibly mysterious, and feels like you are a spy in 80’s New York City, darting through subway passages and hiding behind corners. This vibe continues into the songs “Depth Overload” and “Reverberatory Loops” which use a combination of voice samples, resonating bass and fuzzy distortion. Soulacybin closes out his 8-track album with a song that is truly a finale. While every song caps in at around an impressive 7 minutes, “Empathogenetic” uses every second to include each element heard throughout the rest of Slug Cuddles, adding extra zest in every moment. A droning, sustained guitar riff carries us into stretchy bass and an distinct half-time beat, permeated by enticing drums and samples of laughter. Suddenly, all other sounds begin to fade but gentle, rhythmic snaps and the sweet strum of the guitar, and Soulacybin gracefully ends our sonic journey.